Do you like Tequila? I most certainly do and think that it’s the most amazing drink to use for shots in the world! 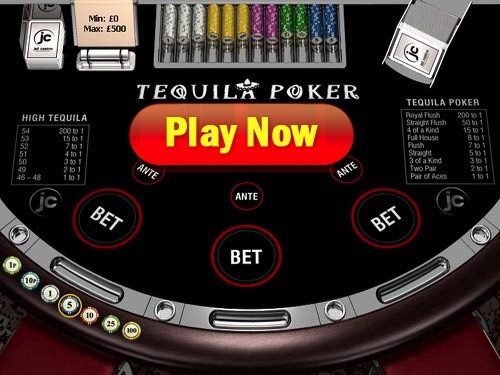 PlayTech seems to think the same, as one of their casino poker games is known as Tequila Poker. It’s among one of the funniest and most action packed poker games, I’ve ever played and I really have play a lot of them. That says something right there. Main factor, also one that makes this game so exciting, is that player can choose between two ways to win. You either go for the commonly known, valuable hand that is based on the strength of your hand or choose the alternative. The alternative is going for the point score of your hand, that’s right – just like in BlackJack. Card values are added up and you can earn a payout even when your hand does not contain a pair ! Cards are valued following the common standards with numbered cards showing their value, all face cards being worth 10 points and aces being worth 11 points. ”Ante” is placed before the gameplay starts and 4 cards are dealt on the table layout. Once they are, you are presented with three options to pick out of. ”High Tequila” – choose to go for a qualifying point score with five of the six cards dealt on the table. To qualify for a payout, you’ll have to collect at least 46 points using five most valuable cards. ”Tequila Poker” – the classic way of playing poker by making a hand out of 5 cards. Note that to qualify for a payout, your hand will have to be equal to a pair of aces or better ! ”Fold” – the least exciting option of all three. Simply give up and lose your ante bet, but don’t risk any additional wagers. So once you’ve picked the option, unless it’s the ”fold, dealer will proceed to dealing the last 2 cards and determining whether you qualify for the minimum requirements. If so, payouts are awarded according to the paytable. Of course, the payout table is progressive – the stronger or more valuable hand is dealt, the higher payout odds are awarded. There are two payout tables, depending on the way you end up choosing and playing your hand in. This is exactly all you need to know about payouts! There’s nothing else to claim or do – simply collect your winning, which happens automatically when playing at online casino sites. The only piece of strategy would be not to go for unrealistic options, while playing Tequila Poker. Remember that only 5 cards are taken into account, when determining whether a hand qualifies or not, thus you shouldn’t go for the minimum point score (46), when holding anything less than 36 points. You can still make it with 35, of course, but the chances of an ace appearing as one of the two final cards is way smaller than the same for a face card. Did you get what I was trying to point out? This game can only be played at casinos powered by PlayTech, thus unfortunately it’s not available to US players at the present. If you aren’t based there, you should give it a try at Winner Casino, as these guys offer some really incredible bonuses - $/£30 FREE with no deposit needed. If you’re willing to deposit and play for higher stakes, there’s also a welcome bonus of up to $2,000! CLICK HERE to Join Now!